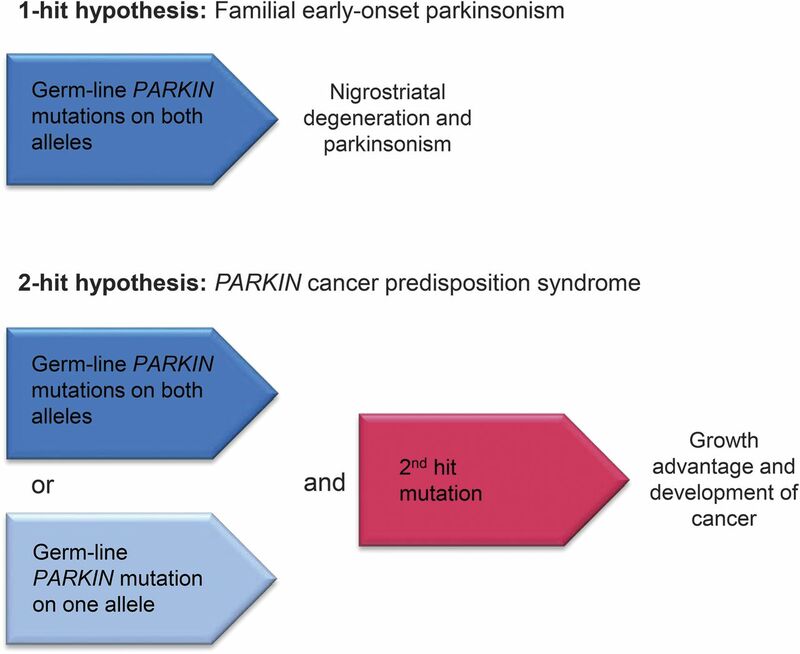 Is PARKIN parkinsonism a cancer predisposition syndrome? From the Parkinson's Institute and Clinical Center, Sunnyvale, CA. Mutations in the PARKIN gene (chromosome 6q25-27) were first described in 1998 in families with “juvenile” autosomal recessive parkinsonism. More than 180 causative variants in the PARKIN gene have been identified; point mutations and copy number variants (i.e., exon deletions or duplications) occur at nearly equal frequencies.1 PARKIN is one of the largest genes in the human genome (1.3 Mb) and contains a chromosomal fragile site (CFS) FRA6E (6q26) between exons 2 and 8. This is of interest regarding the etiology of cancer because CFSs are prone to spontaneous breaks leading to chromosome alterations. Therefore, it is not surprising that PARKIN mutations have also been found in various cancer cell lines and primary tumors.2,3 Mutations in PARKIN show decreased PARKIN E3 ligase function with resultant accumulation of cyclin E, creating the potential for mitotic instability in dividing cells. Because the same PARKIN gene mutations that lead to early-onset parkinsonism are also found in numerous cancer types, particularly glioblastoma multiforme (GBM),3 it is surprising that PARKIN mutations rarely result in both parkinsonism and GBM. This report describes such a patient with compound heterozygous mutations in PARKIN, early-onset parkinsonism, and GBM. At 44 years of age, the patient began experiencing parkinsonian symptoms, which started with a rest tremor in the right leg and leg dystonia. He had a good response to dopamine agonists. At age 46, CT and MRI head scans revealed 2 masses in the left temporal lobe. He underwent subtotal resection of the temporal lobe masses followed by radiation and chemotherapy. Tumor histology was GBM. Six months after surgery, there was recurrence of the tumor, and the patient died 14 months after surgery. At autopsy, there was a 1.5-inch-diameter tumor located within the left temporal lobe. Histologically, the tumor was a typical infiltrating glioblastoma with pleomorphic dedifferentiated astrocytes and areas of necrosis with “pseudopalisading” cells. It infiltrated and obscured the nucleus basalis of Meynert. Additional pathology of note included severe nerve cell loss and gliosis in the substantia nigra but no Lewy bodies or Alzheimer pathology. The locus coeruleus had no definite nerve cell loss, but slight nerve cell loss and gliosis was seen in the dorsal motor nucleus of the vagus nerve. Given the rarity of PARKIN mutations and GBM, their concomitant occurrence in a single individual may well be more than a coincidence. In general, the etiopathogenesis of most cancer is based on the 2-hit or multiple-hit hypothesis. In the case of patients with parkinsonism with PARKIN mutations, they already carry the first hit in every cell (figure). A second hit due to environmental influences (e.g., radiation, toxicants) can then lead to cancer such as ovarian cancer, hepatocellular carcinoma, breast cancer, colon cancer, and GBM.2,3 This concept is well described for cancer predisposition syndromes, i.e., breast cancer (BRCA1 and BRCA2 genes) and familial adenomatous polyposis (APC gene), in which an inherited genetic variant that is present in every cell of the human body combined with an acquired sporadic mutation induces tumor formation. Loss of PARKIN protein in familial Parkinson disease leads to accumulation of one of its substrates, cyclin E, which has been shown to cause neurodegeneration. We propose that our presented case of glioblastoma multiforme and familial parkinsonism could have developed by acquired somatic mutations in addition to the first hit of PARKIN mutations. Future clinical genetic studies are needed to determine whether there is indeed an increased risk for development of malignancies in PARKIN carriers. Although there are epidemiologic studies that suggest a lower risk for cancer in patients with neurodegenerative diseases,6 an increased cancer risk has been reported for LRRK2 parkinsonism,7 and several cohort studies are being conducted to further understand the causal relationship between cell death in Parkinson disease and uncontrolled cell growth in cancer. This could be a result of impairment in cell cycle regulation, resulting in both neurodegeneration and malignant proliferation. If additional clinical and experimental evidence proves cause–effect relations for an association between PARKIN mutations and cancer, it could open up a new area of cancer research. Furthermore, if larger clinical studies in PARKIN mutation carriers confirm an increased cancer risk, families with PARKIN parkinsonism will be a critical group to target for cancer screening. Acknowledgment: The authors are indebted to the family for their participation in this study and long-term commitment to help understanding the underlying genetic causes of Parkinson disease. Dr. Lysia Forno, who recently died at age 97, performed the neuropathology evaluation of the brain. She was a dedicated and passionate neuropathologist and inspiration for everyone around her. Author contributions: B.S. and J.W.L. designed the study. C.B. and L.R. curated and analyzed the brain autopsies. All authors wrote and edited the manuscript. Disclosure: Dr. Schüle receives research funds from Life Technologies/Thermo Fisher, Berg Pharma, Biogen Idec, Parkinson Alliance/Parkinson's Unity Walk, Michael J. Fox Foundation, and California Institute for Regenerative Medicine (grants #RT2-01965 and #RT2-01880). Ms. Byrne receives research funds from Berg Pharma, Department of Defense (grant #W81XWH-11-1-0310), and the Michael J. Fox Foundation. Dr. Rees receives research support from Berg Pharma, Biogen Idec, the Michael J. Fox Foundation, GE Healthcare, and the Department of Defense (grant #W81XWH-11-1-0310). Dr. Langston receives research funds from GE Healthcare, Biogen, and Department of Defense (grant #W81XWH-11-1-0310). He serves on the Michael J. Fox Scientific Advisory committee. He is the coeditor of the Journal of Parkinson's Disease. Dr. Langston spends 35% of his time in his clinical practice. Go to Neurology.org/ng for full disclosure forms. The Article Processing Charge was paid by The Parkinson's Institute. Accepted in final form September 14, 2015.
. Distribution, type, and origin of Parkin mutations: review and case studies. Mov Disord 2004;19:1146–1157.
. Alterations in the common fragile site gene Parkin in ovarian and other cancers. Oncogene 2003;22:8370–8378.
. Somatic mutations of the Parkinson's disease-associated gene PARK2 in glioblastoma and other human malignancies. Nat Genet 2010;42:77–82.
. Comparative genomic hybridization solves a 14-year-old PARKIN mystery. Ann Neurol 2015;78:663–664.
. Patient and treatment factors associated with survival among adult glioblastoma patients: a USA population-based study from 2000-2010. J Clin Neurosci 2015;22:1575–1581.
. Inverse association between cancer and neurodegenerative disease: review of the epidemiologic and biological evidence. Biogerontology 2014;15:547–557.
. Higher frequency of certain cancers in LRRK2 G2019S mutation carriers with Parkinson disease: a pooled analysis. JAMA Neurol 2015;72:58–65.